Flags On A Stick is the leader in providing decorative garden and house flags, as well as coordinating Mailwraps Magnetic Mailbox Covers, Address Signs, Door Decor and Doormats. We are the premier flag store offering high-quality, seasonal and holiday decorative flags for your home and garden. Our goal is to exceed our customers' expectations by providing superior customer service, plus FAST delivery of your order directly to your home. Boutique Shopping: We specialize in unique, hand-selected garden decor. Enjoy knowing that each flag, mailbox cover, address sign, door decor and doormat on our website is chosen for its artistic detail, style, and durability. Our large selection of decorative outdoor garden and house flags are durable, UV-light resistant, and hand washable. Decorative flags are the newest trend in home and garden decor. We buy only from the best manufacturers in the industry, who provide products created by our nation's leading artists. Shopping at Flags On A Stick online store allows you easy access to the newest designs for every season and holiday. All our products are designed to enhance your home from curb to door. Enjoy shopping online decorative flags with shipping directly to your home. OUR STORY: Flags On A Stick is a family owned business created by Becky in 2001. After growing frustrated with the lack of decorative flag stores here in our home state of Minnesota, Becky set out to start her own flag company. The first store was at the Minnesota State Fair in 2002. The adorable white cottage-style outdoor booth was built by friends and family. It was decorated with all the newest seasonal and holiday decorative flags. 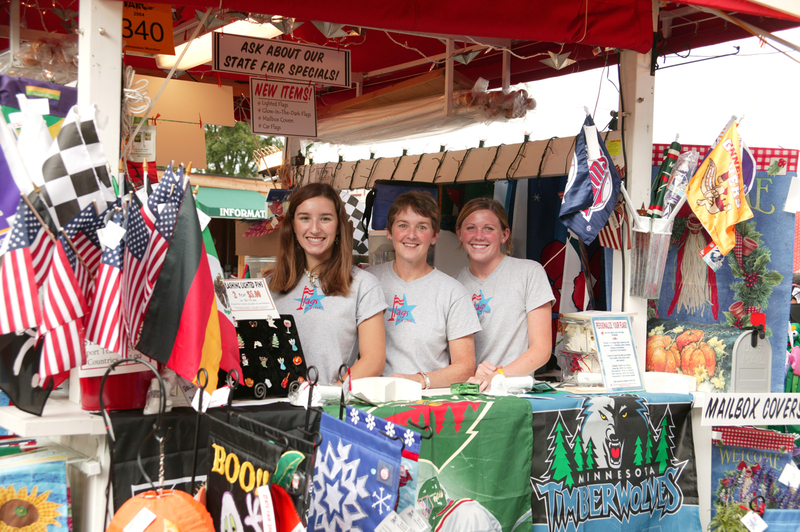 Local high school and college students were hired to help run the store during the hectic 12 days of the State Fair. The weather was hot, the hours were long... but we learned so much from my wonderful customers, many of whom still continue to shop with us online or by phone. We no longer have a store at the Minnesota State Fair, but the focus of our business still remains the same: Providing our customers with the newest seasonal and holiday decorative flags available. Always making sure the fabrics are high-quality and the designs are from our nation's best artists. In addition to decorative flags, you'll find matching garden decor including mailbox covers, address signs, door decor and front porch welcome doormats. Our family and staff love what we do. We enjoy bringing smiles to our customers' faces by adding whimsical touches of color to their outdoor decor. We sincerely appreciate your business and hope you will shop with us at www.flagsonastick.com for your outdoor decorative flags, magnetic mailbox covers, address signs, door decor and door mats.